Participating in the Potomac Place ribbon cutting were (l. to r.) Monica Lingenfelter, Shepherd University Foundation executive vice president; Jeffrey Resetco, EdR vice president of real estate and development; James Vigil, Shepherd vice president for administration; Chris Colbert ’95, Shepherd University Foundation vice president; Dr. Mary J.C. Hendrix ’74, Shepherd president; Dr. Marcia Brand, Shepherd Board of Governors chair; Mike Smith ’89, Shepherd University Foundation president; and Gary J. Garofalo, Harkins Builders president and COO. 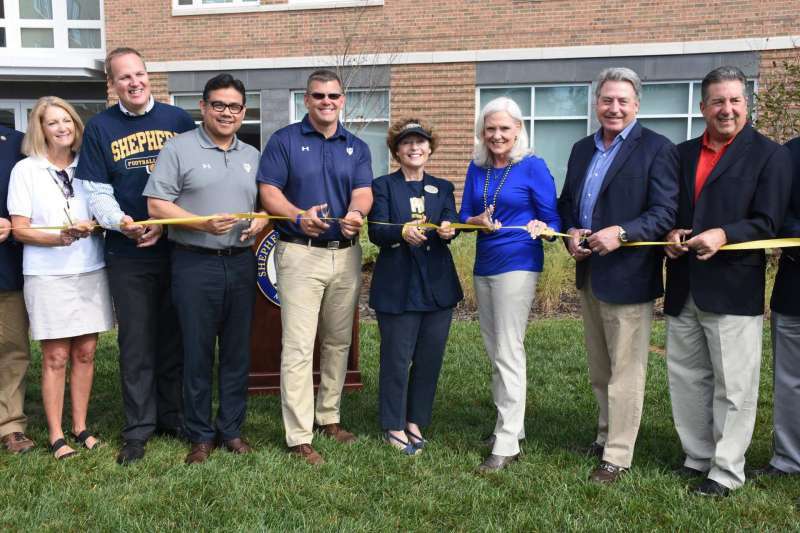 Shepherd University hosted a ribbon cutting for its newest residence hall, Potomac Place, on Saturday, September 23. The $22 million building is a mix of single and double suite-style units with 298 beds. EdR of Memphis, Tennessee, oversaw the project. The architect was Design Collective of Baltimore. Harkins Builders of Baltimore/Washington/Philadelphia constructed Potomac Place. This marks the first time Shepherd University has partnered with the Shepherd University Foundation to construct a campus building. The West Virginia Economic Development Authority provided a construction loan to the Shepherd University Foundation Supporting Organization, which owns Potomac Place. The university manages the building. Now that the building is complete, the construction loan will be replaced with 40-year financing from the U.S. Department of Agriculture Rural Development Office. Once that loan is paid off, ownership will transfer to the university. Speakers for the ribbon cutting were Dr. Mary J.C. Hendrix, Shepherd president; Dr. Marcia Brand, Shepherd Board of Governors president; James Vigil, Shepherd vice president for administration; Chris Colbert ’95, Shepherd University Foundation vice president; and Jeffrey Resetco, EdR vice president of real estate and development. 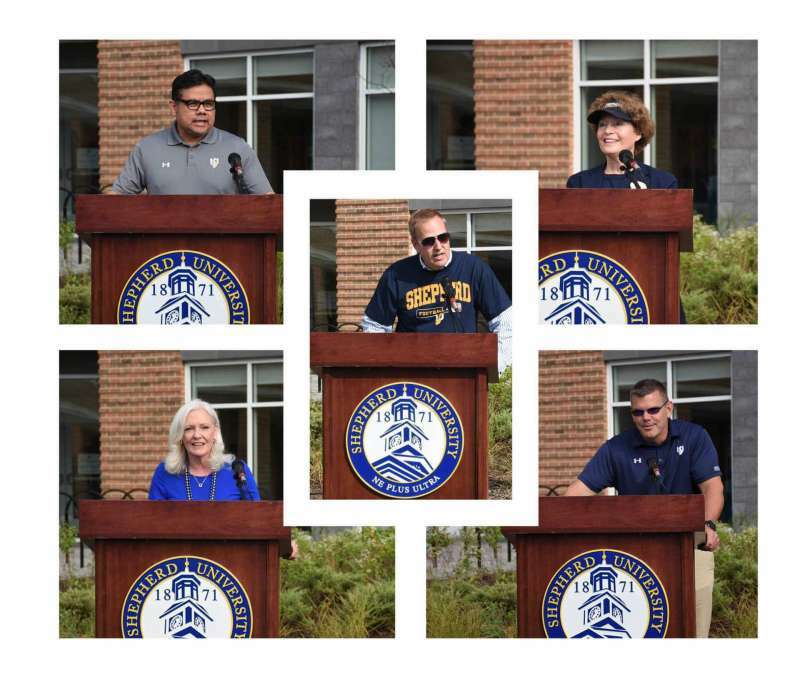 Clockwise, from top left: James Vigil, vice president for administration; President Mary J.C. Hendrix ’74; Chris Colbert ’95, Shepherd University Foundation vice president; Dr. Marcia Brand, chair of the Shepherd Board of Governors, and (center) Jeffrey Resetco, EdR vice president.